Kaftans like this one were worn by Ottoman princes who died when they were children. They were preserved in imperial tombs where, in accordance with Ottoman custom, they were placed over the graves of the deceased. This kaftan may have come from one of the graves of the 19 younger sons of Sultan Murat III. They were executed at the succession of their half-brother, Mehmet III, in 1595. This gory practice, designed to avoid a struggle for the succession, was never repeated. The pairs of wavy lines represent the pelts of the striped tiger. In the Islamic world, this design acquired powerful associations. The Iranian hero Rustam, for example, is usually depicted wearing a tiger-skin coat. By 1500 the motif was popular on Ottoman Turkish textiles. Kaftan, silk tissue in white, blue and gold woven with a twill tie on a red satin ground. 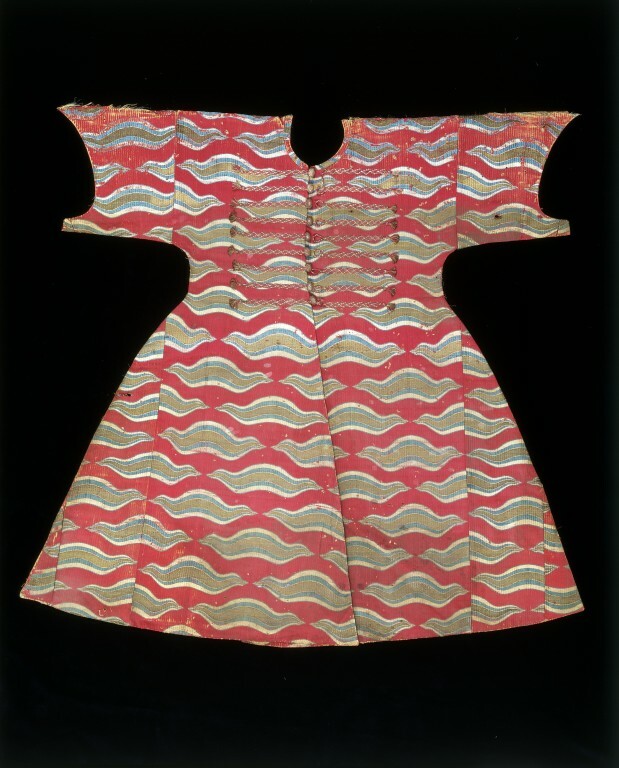 It is trimmed with red and white silk, and gold thread. Said to have been removed from a royal tomb in Istanbul or Bursa. 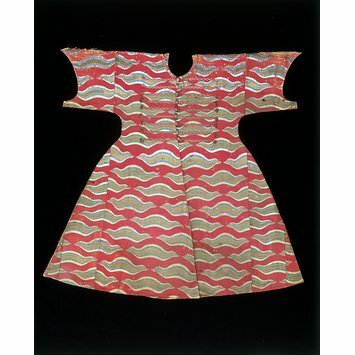 Child's silk kaftan with tiger stripes, Turkey (probably Bursa), ca. 1590.